In the tradition of Quality Breeding we introduce Whatta Wisler's Texas Parti Boy "Jasper"!! 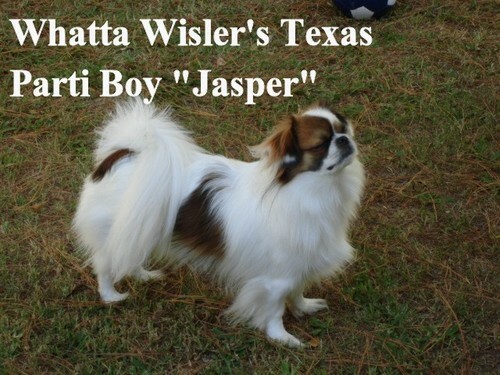 Whatta Wisler's Texas Parti Boy "Jasper" is sired by Nationally Ranked '07 AKC CH. Whatta Wisler's Boy I Am "LeStat" out of the gorgeous "parti" Whatta Wisler's Hurricane Parti!! He is bred by Tanya C. Wisler and Dr. M. Wisler. He is owned and loved by Nicole in North Carolina!! This handsome "parti" boy is the same pedigree (different litter/sires and dams are littermates) to our Multi Best of Breed Winner AKC CH. Whatta Wisler's Lord Of The Ring "Lourdes"!! !